Datalogic Magellan 3200VSi - Multi-Interface, 1D/2D Model, Counter/Wall Mount. Scanner Only - Cables and accessories must be purchased separately. These include USB (Part# 8-0938-01), PS/2 (Part# 8-0735-03), or RS-232 Serial cables (Part# 8-0730-54), AC Line Cord (Part# 8-0935), and a Power supply (Part# 6003-0941). The Datalogic Magellan 3200VSi barcode reader brings Datalogic's imaging technology to the high-volume point-of-sale. It is the first barcode scanner to duplicate the speed and wide field-of-view of high-performance omnidirectional laser scanners while adding the benefits associated with imaging. This imaging technology provides outstanding performance when capturing hard-to-read barcodes such as truncated (short), out-of-spec, poorly printed and GS1 DataBar codes, and provides support for both linear (1D) and 2D label decoding. The Magellan 3200VSi imager enables both sweep and presentation scanning techniques ensuring maximum productivity and ergonomic ease. 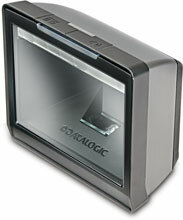 The Datalogic M3200-010210 is also known as Data Logic	DTL-M3200010210	or M3200010210	.